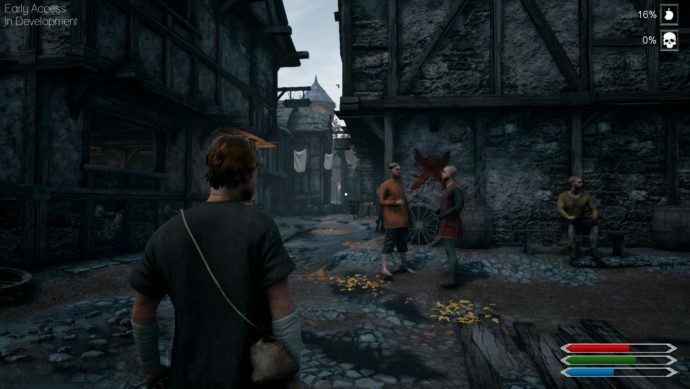 The Black Death is an open-world MMO with crafting elements. It also tests the boundaries of what can and should be sold on Steam. Read our full preview to find out more. It hardly bares repeating in 2016, but Steam’s Early Access platform more closely resembles tsunami-weathered scaffolding than a ‘platform’. Facetiousness aside, Early Access’s good intentions have paved the way for a mudslide of broken, incompetent and rushed out games. You expect Beta and Alpha games to be unfinished, but far too many of them seem to be ‘un-started’. Such is the current standing of The Black Death, an otherwise conceptually promising MMMO (that’s Medieval Massively Multiplayer Online game) that boasts nought but plague-ridden foundations and literal bugs aplenty. Like all crafting-based survival MMOs, I really want to like The Black Death. Its sandbox world isn’t particularly beautiful – it suffers from the usual Early Access framerate drops, texture glitches and low field of view – but it evokes a bleakness you could really sink your teeth into. That is, if you could actually play the damn thing. After being sent back and forth between server menus and the main menu a few times, I finally managed to make it into The Black Death proper. Unfortunately, my character began floating into the sky of a textureless, gray-boxed world. There’s a rather large medieval setting to explore in The Black Death, it just can’t be interacted with in any meaningful way. 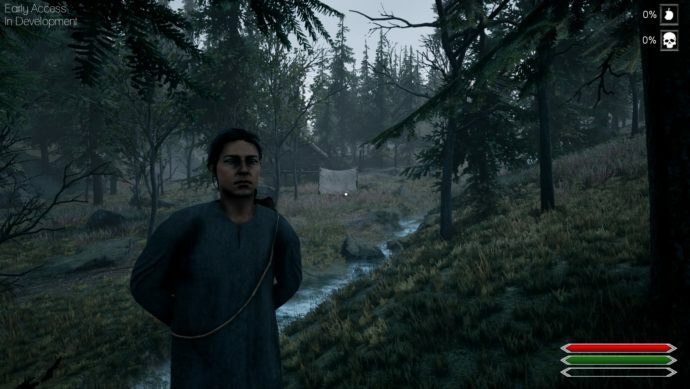 When I did finally create a character and embark upon my gargantuan quest to not die of the plague, my excitement was immediately drowned by broken controls, poor collision detection, a rather obtuse user interface and an overwhelming sense of purposelessness. 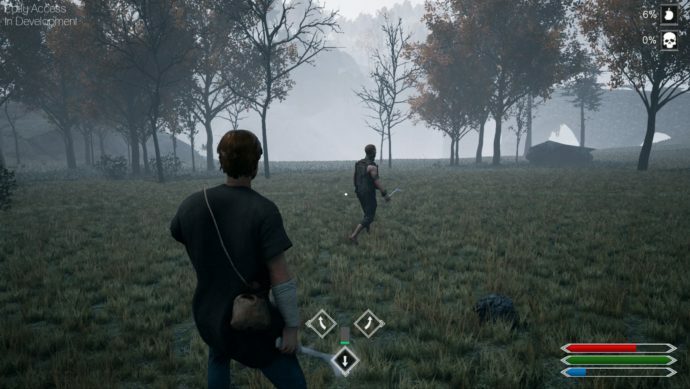 My character couldn’t fight without first crafting a stick (apparently punching hadn’t been invented yet), but every tree in The Black Death appeared to be unshakeable. I could gather cotton, fruit, and steal fish from a wrecked market stall, but that was my sole interaction with The Black Death‘s world. Eventually, I headed for a large city in the distance, whereupon my character lost the ability to open doors or interact with objects, rendering any exploration of towns and cities useless. Well why not head out into the wilds, and fight fierce animals or hardened bandits? Not being able to fight sure hampers those experiences, as does the fact that bandits don’t seem to be guarding anything of any worth, aside from the small number of brain cells they collectively share. The only reason they didn’t kill me was because they either lost interest, ran in the wrong direction, or started clipping on a nearby rock. Even Skyrim’s bandits come with more personality – these just quietly and apathetically poke sticks at anyone who dares stumble upon their empty camps. This bandit wasn’t interested in me, because I had lost the ability to physically assault him. That’s right: there’s very little sound in the game, aside from the odd sword noise and an underlying stock fantasy theme. NPCs silently play lutes and engage in unheard conversations within the game’s main city – it’s like an even eerier version of the fantasy them park from Westworld. There’s just very little of worth to do in The Black Death. When some kind disgruntled player eventually dropped a bone club for me to wield, the game bugged out and wouldn’t let me swing it after a few tries. Handy, I guess, that the next group of bandits I encountered simply walked past me, probably taking pity on my unsuccessful attempts to swing a bone around my head. When I restarted the game (yes, I had to restart so that my character could attack/open doors again), the fight that ensued resembled the sort of stiff, muted jiggery-pokery that would embarrass even a Runescape NPC. The bandit and I prodded at each other sans emotion, until I died, was informed that I had been killed… by me, and respawned, only to find myself unable to open doors once again. It was devoid of action, urgency, and like the rest of the game, completely lacking in feeling. All of game’s player models are strangely androgynous, regardless of gender. They also all look alike, but don’t physically resemble their visual representative in the game’s inventory UI. There are Betas, and there are Alphas, and then there are games that have no right being sold on any storefront, digital or physical. The Black Death could’ve used a few more months in the pipeline before it was sold in this state – it is a barren world to occupy, not just visually and thematically, but mechanically as well.